Coping with NMM Copper - an illustrated painting guide. As my latest project has required me to have a go at painting NMM copper. 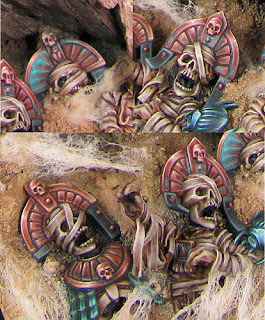 I thought I'd post an illustrated guide to my technique as an addition to my earlier guide to Painting NMM armour. 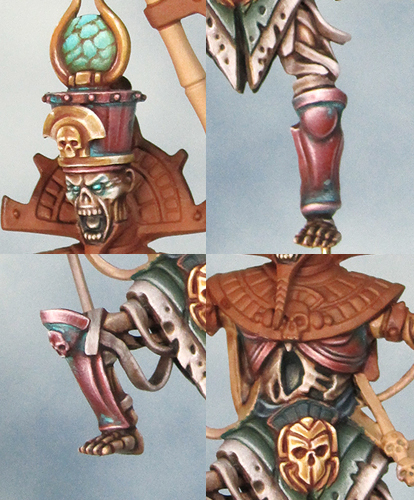 Before going any further I need to point out that most of the colours I've used are from the old Games workshop paint range. I'm using up my stocks before buying new so I will talk about the type of colour needed as well as an exact colour reference. My Colour Palette for copper. The basic principles are the same as any other NMM in that you need to achieve a strong contrast between the highlight and shade. Make sure that the midtones have a smooth transition and that the highlights are as small, sharp and precise as possible. The trick to getting a convincing copper effect seems to be in picking the right colour palette. 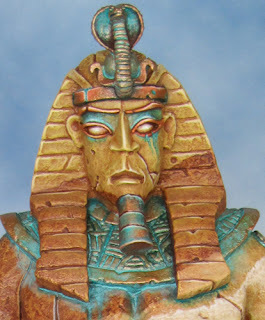 On initial consideration it seems obvious that copper would be best represented by using orange/brown tones but a little research suggested a slightly different approach. Orange needs to feature in the effect but it seems best used as a secondary colour to add some warmth and nuance to the shadows. Copper can often appear to have a somewhat cool pinkish cast to it's colour and this is the look I have tried to represent. As I was also aiming for an antique look to the copper I tried to keep the tones fairly muted and not too light/bright in the mid range. 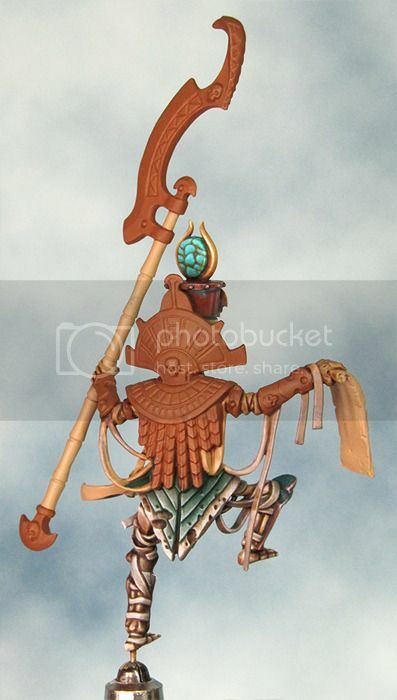 The picture above was particularly influential on my approach to NMM copper. as opposed to the warmer orangey tones on the shaded side. Select a shade of dark brown that has a lot of red in it for your base colour. 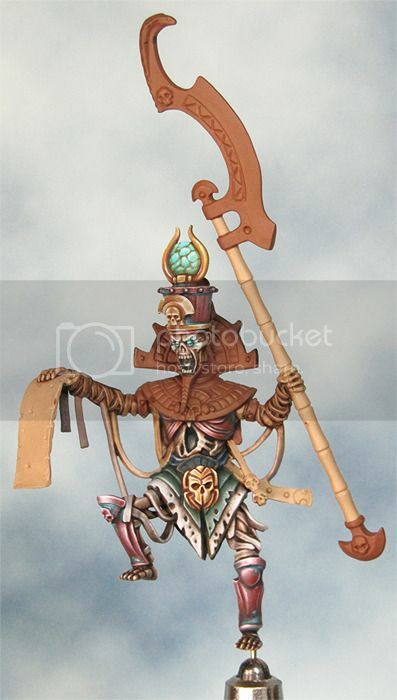 The colour I used was the old Citadel Scorched Brown. Step 2 Mid Tones & Highlight. Gradually add on ivory colour to the base colour to create the mid tones. As you lighten the base colour the presence of red means that the colour will develop a (comparatively) pinkish look. Continue to lighten the colour untill you wuse pure ivory for the final highlights. Remember to keep the final stages of highlights as small, sharp and precise as possible. Once the copper is painted up it's time to have fun applying verdigris. How much of the affect you use is very much a matter of choice. verdigris can be kept to a few spots of green in the recesses or it could entirely cover the copper in a rough crust. I'd advise a quick picture search for inspiration and reference. The colour can vary greatly from green through bluish tones to white. Personally I like to have a bit of a mix. I first apply my green tones as a wash and then, before that colour is dry, dab on another wash of a pale green/ivory mix. You can continue to build up varying green & pale green layers until you are happy with the result. This is one situation where you really don't want a perfectly smooth colour blend but instead aim for a blotchy stained look. 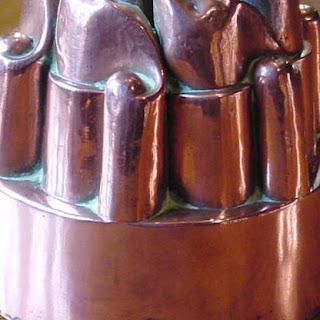 The verdigris effect can be used equally well with proper metallics. 'stain' has run over the surrounding stone. Painting has been very slow recently but it's time I posted a few work in progress pictures. I'm working with (for me) an extremely subdued colour palette and I'm really enjoying the experience/challenge. The use of Ivory (rather than white) in all the highlights and a combination of Dark Sea Blue and various browns in the shadows plays a major part in this and helps keep the overall palette unified. In addition to my new Windsor & Newton series seven I've bought myself a few brushes from the excellent Rosemary & Co and I will be posting a review/comparison in the near future. 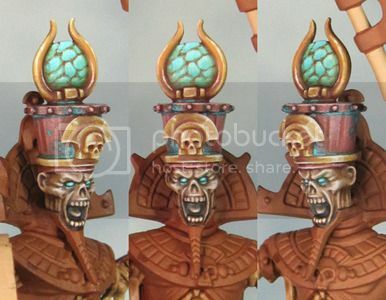 Just a quick post to show the weekend's progress on my Tomb King. I've begun to apply my colour scheme to the mini. So far I'm very pleased with how things are going although it's only at an early stage and the scheme will need to develop as I progress.